DDL triggers are fired whenever Data Definition Language (DDL) events like Create, Alter, Drop, or Data Control Language (DCL) events like Grant, Deny or Revoke occurs. • to Issue an alert when a DDL event occurs in Database or Server. • to log information about database-level DDL events and Server-level DDL events. • to Secure the database or server from malpractice. Refer below link,for more information about different Scope of DDL triggers. By executing below query,we can get hierarchy list of DDL events & DDL grouped events. Sql server gives flexibility to handle DDL events in DDL triggers,you can see that in the highlighted section of below image. 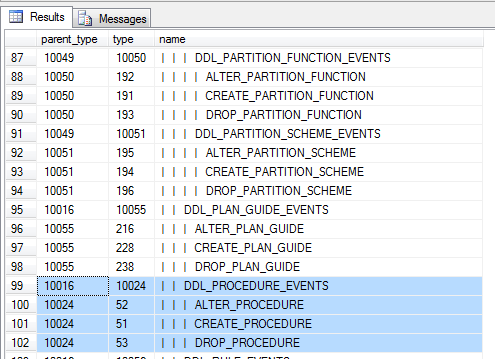 Rownumber 99 – DDL_PROCEDURE_EVENTS is to handle all events related to procedure in trigger. In rownumber 100,101,102 - ALTER_PROCEDURE,CREATE_PROCEDURE & DROP_PROCEDURE is to handle required procedure related events separately in trigger. EVENTDATA() can be used inside the body of a DDL or logon trigger and returns data only when referenced directly inside of a DDL or logon trigger. EVENTDATA() – captures information about an event that initiated a DDL trigger to fire. EVENTDATA() returns data in the form of XML. EVENTDATA() returns null if it is called by other routines, even if those routines are called by a trigger. Use xquery to get values from XML fragment and insert into log table. Good documentation on eventdata().. Appreciate it.